On Thursday, April 11th, Professor Steven Kruger spoke to Fordham undergraduate and graduate students about his early career and research in medieval literature. Dr. Kruger, visiting from CUNY Graduate Center, Queen’s College, New York, discussed his development as a scholar and his approach to writing. Importantly, he addressed the significance of historical research that contributes meaningfully to present-day cultural issues. The Master Class was inspired by undergraduate coursework done by this year’s Freshmen Honors cohort in the English Department. Upon reading Kruger’s article, “Claiming the Pardoner,” written in 1994, students wondered how Kruger might add to his views on Geoffrey Chaucer’s enigmatic character 25 years later. Dr. Kruger specializes in gender, sexuality, feminist and queer theory, and medieval literature. Dr. Kruger's publications include many articles on these topics, as well as book-length studies including AIDS Narratives: Gender and Sexuality, Fiction and Science; Queering the Middle Ages (co-ed. with Glenn Burger); and The Spectral Jew: Conversion and Embodiment in Medieval Europe. We are grateful for the support of Fordham University Center for Medieval Studies, the Department of English, and graduate student David Smigen-Rothkopf whose gorgeous flier artwork is featured here. On Wednesday, April 10th, Fordham faculty members gathered for a workshop on the Nobel Prize-winning author Doris Lessing (1919-2013). Professor Chris GoGwilt convened the group, and he and Professor Anne Fernald moderated the conversation. After short papers by Profs. Seda Arikan and Cornelius Collins, the group discussed Lessing's evolving ethical commitments over her long career. Among other issues, the group discussed Lessing's shift from an ethics of virtue in the 1950s (as seen in the Children of Violence novel cycle) toward an ethics of self-care by the 1980s (as seen in the novel The Good Terrorist); her short story "An Old Woman and Her Cat," her wider interest in cats and the nonhuman, and how that might connect to a contemporary ethics that extends beyond the human; how Lessing's dedication to Sufism compares with Iris Murdoch's Platonism; and Lessing's often unrecognized irony, humor, and gift for satirical mimicry. Seda Arıkan teaches at Firat University in Turkey at the Department of Western Languages and Literatures. She is at Fordham as a visiting scholar and currently working on her book about ethics in Doris Lessing's novels. Cornelius Collins teaches literature and writing here in the Fordham English department, and he is the outgoing president of the Doris Lessing Society and will soon take the helm as co-editor-in-chief of Doris Lessing Studies. Anne Fernald is Professor of English & Women’s, Gender, and Sexuality Studies. Beginning in Fall 2019, she will be co-editor-in-chief of the journal Modernism/modernity. Raymond A. Joseph, the former Haitian Ambassador to the United States recently visited Professor Elizabeth Stone's "New Wave Immigrant Literature" class to tell his own immigrant story as someone condemned to death in absentia by the government of François Duvalier, president of Haiti from 1957-71. Joseph, who first came to the United States as a teenager to study theology and to translate the Bible into Creole, has also previously been a reporter for The Wall Street Journal, and one of the founders of The Haiti Observateur. He is shown with class member Olivia Lucas who presented a brief biographical report on Ambassador Joseph to the class. Congratulations to English major Julia Gagliardi, FCRH’19, who has been named a finalist in the Southhampton Stony Brook Short Fiction Contest for her story “The Chapel of Love” and was recently among those selected as a Creative Writing Concentrator. Storytelling of all sorts is close to Julia’s heart––she writes powerfully and persuasively in creative writing classes about her Irish aunts and is a story-telling mentor and founding member of “Our Story,” an event featuring student storytellers who create and share their personal stories with a live audience. Congratulations to Fulbright recipient Elodie Huston! Come to "Documenting America's Wars: A Conversation with Director Ian Olds"
Award-winning director Ian Olds will join Fordham's Graduate Film Group for the talk “Documenting America’s Wars: A Conversation with Ian Olds” on Wednesday, April 25th from 5:30-7 pm at the Fordham Law School at the Lincoln Center campus (room 3-03). The event will be followed by a reception. Ian Olds is the co-director of the “grunt’s-eye view” documentary Occupation: Dreamland (2005), winner of the 2006 Independent Spirit Award, and the director of Fixer: The Taking of Ajmal Naqshbandi (2009), the chronicle of an American journalist and Afghan interpreter during the War in Afghanistan, which earned Olds Best New Documentary Filmmaker at the 2009 Tribeca Film Festival. His more recent collaborations with James Franco and independent forays into short film have led to spots at some of the most prestigious film festivals, from Sundance to Rotterdam, as well as a Guggenheim Fellowship. 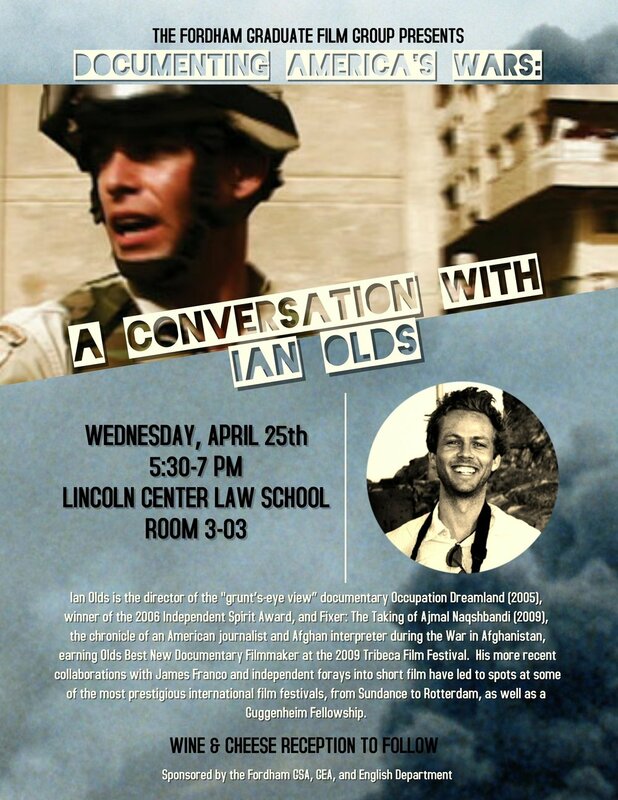 On the 25th, Olds will discuss his work on Occupation and Fixer—his personal journey, craft as a war documentarian, and experience covering Iraq and Afghanistan—as well as his broader thinking about the art and politics of documentary filmmaking and representing today’s armed conflicts. Thanks to the generous support of the GSA as well as the GEA and English Department, the Graduate Film Group thrilled to be able to open the talk to all Fordham students and faculty but seating is capped at 90 people, so if you want to secure a seat in advance, please RSVP to wardocumentarytalk@gmail.com. It is a shaping-up to be an important and exciting evening of interdisciplinary exchange, so no matter your field or background: be there! Fordham English major Taylor Shaw published an interview in the Fordham Ram with writer Rigoberto González, who last Monday read his work to a huge crowd at Pope Auditorium as this year's participant in the Reid Family Writers of Color Reading Series.